Chesapeake Red Tent Temple started after my first experience at the Southeastern Women’s Herbal Conference in October of 2010. 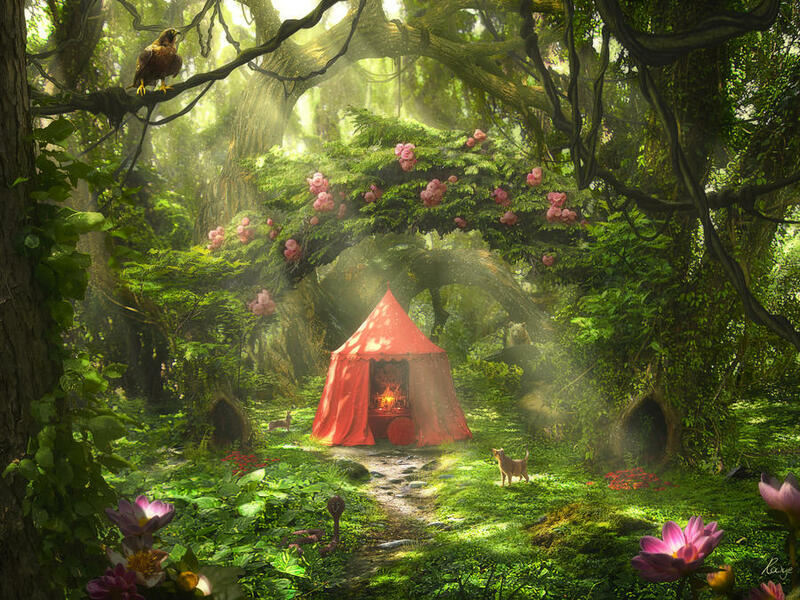 There was a Red Tent set up on the site, which I dared not enter. It was too mysterious, too weird. I didn’t know what to expect even though I had read the novel, The Red Tent, by Anita Diamant. My daughter, Elizabeth, and I, had a vendor tent set up to market out tie dyes, upcycled clothing, needle felted dolls, and deliciously scented oils and scrubs. The body care products all melted in the heat, by the way! There were women at the conference speaking about the Red Tent Temple movement and while I was stuck in fear about entering the Red Tent, I was also intrigued. So I went to a talk. I left that talk On Fire with a passion to create a space like that in my home. Something for the community of women in my area but really mostly for me! A place where we could sit together, in safety, in integrity, and in acceptance, and share our hearts with other women. Safe, Sacred Space. And I created this! Chesapeake Red Tent Temple was born that same month and we have had a monthly gathering every month since, barring a couple of times when I was violently ill the day of Red Tent and didn’t want to chance exposing anyone to the germs, even if I didn’t attend. In my particular iteration of Red Tent Temple, I provide the gathering space in my home, which is pretty well set up for this sort of thing. What I’ve not had is much contact with other women who are doing this work. I know we all do it differently and I would love more and fresh ideas! We quickly moved out of that space and into a small gardening cottage in my back yard. I won’t call it a shed. I certainly won’t call it a She Shed. I prefer Lady Lair, if offered a choice, but I call it the Temple or the Pumpkin Shack, as it is painted pumpkin orange inside. The Pumpkin Shack where most of the years of Red Tent gatherings have happened. By the first RTT of 2011, we were firmly ensconced in the Pumpkin Shack, sitting in camp chairs, burning paraffin candles and strings of Christmas lights for softness, and sharing snacks and a talking circle. We had to cross the back yard and go into the house to use the restroom. This led to everyone holding it as long as we could and then having a mass exodus in the midst of our talking circles. Over the years I spent some of my discretionary cash on scarves, red candle holders, blankets and other things to create a womb-like space for us to gather. An old chaise from my oldest son’s college apartment found it’s way there, as did some chairs from younger son’s man cave. We sat on pillows and back jacks, and used a retired twin mattress and box spring for a couch. Every few months I would strip everything out of the Pumpkin Shack, wash all of the linens, knock down the spider webs, and put it all back. My daughter and my son’s girlfriend both helped. It was an act of service to the greater community for all of us, but more than that, it was an act of service to self. An act of self-care and ritual that we all needed. Then several of us moved into our 50’s. Some of the group passed through the gates of menopause. We wanted to sit on actual furniture. We wanted to have our backs and feet supported, as well as our souls. So we moved inside, into my living room with the red couches. Not the deep green entry room, but a larger room with plenty of space for gathering. And a huge bonus: the bathroom are just up the stairs! Honestly, I kind of miss it, the quiet stillness that the Temple/Pumpkin Shack held for us but this is where we are now and maybe one day I will be able to afford a small central unit for the Pumpkin Shack and a half bath. Then we could move back out into the stillness. Anyway, here we are, moving into our 9th year soon! This group has seen me through some of the largest shifts of my life and has held me firm as they happened. We have supported women through some of life’s largest challenges. Women have come and gone. Flowed through. Stayed for years and decided it was no longer a priority for them. Been here since the beginning. Moved away and come still when they are in town for a visit. Had massive meltdowns and stomped off into the wild fury of their own heartbreak. Processed internal conflicts in circle and healed it. Thought it was a drinking party. Held incredible, deep space for one another for months, and years. Learned to listen deeply. Learned that they can take the floor and share their hearts. Learned that they are loved, important, and held in community. This Red Tent Temple has been a beautiful healing space for many women over the years and continues to change and evolve. We have a very basic outline of how things should go, and of who should/may attend. We are free to every woman but if you’d care to leave a donation, please do. It helps me pay for toilet paper and electricity and things. The link to our Facebook Group is here. Answer a few questions and if you live close by, or facilitate a Red Tent or want to facilitate a Red Tent, you are welcome company. Please don’t join so you can advertise your own stuff on our group. Even our members rarely do that. We gather from 6pm – 9pm on the first Sunday after the New Moon. This does occasionally change, but it’s the basic outline. All dates are pinned to the top of the FB page. We plan on meeting for 2 hours and often go over. Several women leave at 9, some stay later. It’s okay if you’re late, okay if you leave early. No men, no children, except non-mobile, nursing babies who have to come in order to be fed. The idea being that this is a place of rest for women. All women who have had their first moon cycle are welcome, yes including those who have passed through this and no longer menstruate. Nursing mamas may bring their infants in arms. The space we will occupy is not child proof, so I ask that crawlers and toddlers stay with daddy or a friend. Your femaleness is what we welcome, your possession of a womb, or even of female genitalia is not required. I provide filtered water, tea bags, honey, and whatever we need to eat off of and drink out of, plus the space. There is a donation jar for those who are so inclined. ZERO obligation here. For real. Everyone who has the time and inclination brings some food to share. Because we have some food allergies, we ask that there be no tree nuts or fish, we generally also don’t bring poultry. Gluten containing items need to be noted. We don’t have members with substance abuse issues so it’s okay to bring wine or beer, so long as the use is minimal. Once we’re settled we do a talking circle. That’s about it. We are pretty laid back. Wear comfy clothes and be ready to put your feet up and relax. If you have any specific physical issues that require accommodation, please let me know so that we can be sure to help as best we can.